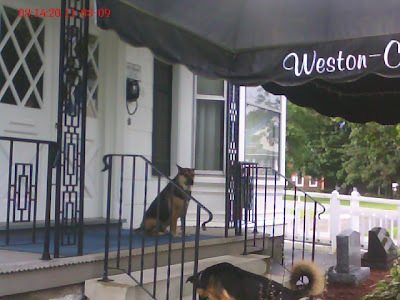 Here is Phin guarding the front door to the funeral home (where I live). I thought he looked so cute just standing there and Abby went up to join him. Phin is definately like his mother, he sits and thinks and is kind of a reclouse at times. He's my big baby. 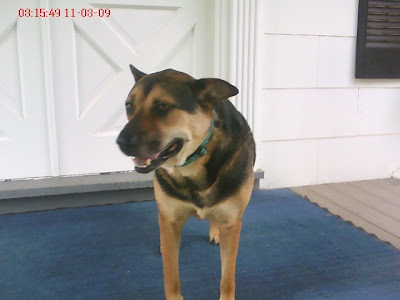 Close up of Phin on the front steps. He was less than impressed about having his picture taken, he was still on the look out. So this is my excuse for not folding and putting away all my clean laundry. 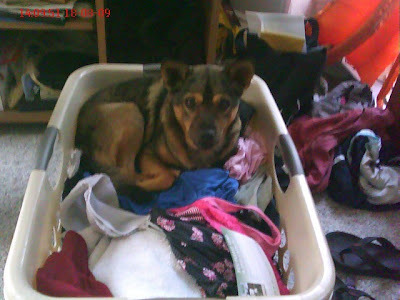 Jetta was enjoying the AC in my room and decided to curl up in my clean clothes. This little dog does anything she wants!